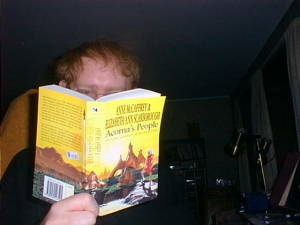 Pic of the day: Reading Acorna's People, The further adventures of the Unicorn Girl, by Anne McCaffrey & Elizabeth Ann Scarborough. Yes, it's a girl book. I'm still curious as to how girls think, even though I don't have much use for it personally. Got up a little later than usual, but not late. Had some fun with the computer and wrote some e-mail before I went shopping groceries. Milk and yoghurt. :) Then I walked back home and ate some bread with potato salad, drank some milk, and continued with the computer. Later in the day, I took a walk, listened to music. My body felt a bit tense. Sometimes I just had to draw a deep breath, just to make sure I could. But the weather was nice, a light cloud cover. And as I walked along the road, I could smell different smells for every few meter. Strange. I felt almost like a dog, living in a world of smell! :) There was the smell of dinner, then of iodine (? ), then of smoke, then of flowers ... it was entertaining in its own way. I was just happy to be able to smell anything, since my nose had been almost closed yesterday. Last evening it sounded like a flute when I tried to breathe through it. There was an article in the latest Psychology Today about placebo. That is, the medication that is supposed to be non-effective. Placebo typically contains sugar or calcium or, if injected, mild salt water. Stuff that is known to not do anything important to the body in small quantities. Despite this, people often react to placebo the way they do to serious medication. The reaction depends on what they are told the placebo is for. If they are given a placebo against pain, it will work as a painkiller. If insomnia is the problem, the same pill will put people to sleep. And so on. Truly a wonderful invention! I knew this already, which is why I really wish I had one now. What I did not know, or had not thought about, was the point the article made. When doing double-blind tests, neither patients nor doctors know which pill is placebo and which is the new drug to be tested out. But if the actual drug has side effect that the placebo has not, then the patients are more likely to guess correctly that this is The Drug. Some patients also get side effects from placebo, but in general real drugs are a bit more toxic, and so they are also a bit more effective. Because people feel the side effects and take heart, knowing this is the Real Thing. Of course, some people may have a commercial interest in denouncing anti-depressive pills as worse than nothing, which is the tentative conclusion of the article if I understood it right. Some psychologists believe that you can talk your way out of anything up to and including heart infarcts and cancer. And I guess to some extent you can. But since we have both body and soul, it would make sense to treat both if at all possible. And I do find it disturbing that so often, the truth depends on who pays for the research.